I was beginning my meditation session the other day when the crane that was working down the street started up it's engine. I chucked to myself and thought - well, that figures. I didn't dwell on the noise though, and aside from that one quick thought the sound quickly faded away. I drifted into my meditative state not bothered or interrupted by the crane or anything else around me. When my meditation ended I found myself once again thinking about the noise from the crane. It made me reflect back to some of the classes I have taken over the years and the varied approaches different teachers would take whenever some sound, noise or vibration would filter through the walls during our periods of meditation. I had one teacher who would always hastily apologize to the class at the end of the session for any disturbance. And there were always several students who would stand in front of her nodding right along, as if they really needed to hear her say those words. Another teacher I had would not say anything if an unwanted noise made it's way into our class. But if a student would mention the noise she would just shrug it off and answer - We don't live on top of a mountain in Tibet, do we? It is what it is. Then I had another class a few years ago where the students would never, ever mention anything about an unwanted noise...except one time. I remember it so well. The student was new and our teacher 'answered' by just standing there - with the sweetest most benevolent smile on his face that I have ever seen. He didn't say a word. 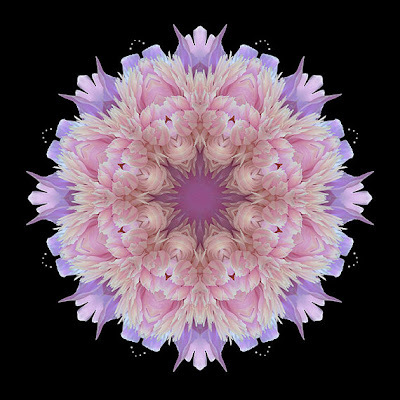 'Flower Mandala, Lavender Pink Peony - Love is Within' courtesy of Karen Casey-Smith. Prints are available in her shop on Etsy.